Whether you are a home improvement professional or someone who wants to tackle a few projects around the house, finding high quality ladders for multi-purpose use that are strong and durable today is a easier than ever with many choices available. This review is especially for you if are a do-it-yourself enthusiast. You need to have a ladder to accomplish multiple home maintenance tasks like painting, cleaning, or small repairs. A few years ago my neighbor was using an old wooden ladder that was literally falling apart. He fell a few times, because of how unstable it was, and after many repeated recommendations for a decent aluminum version, he finally got one. To this day, he always mentions to me how good of an investment it was. Finding a ladder that's whole purpose is designed for versatile use around the house can be difficult because you need to make sure that it is versatile enough to be used for your different projects (whether you are using reviews for commercial quality airless paint sprayers to paint the exterior of a house, hanging Christmas lights, or any other activity which requires you to go upward). It also has to be stable enough for the amount of weight that will be added (you'll want to include tools and supplies that are also going to be used on the ladder when calculating weight. This a great all around versatile folding ladder for virtually any project you can think of around the property. Fitted with multiple configuration capabilities (33 total), the Little Giant can provide various angle support. This includes a 90 degree positioning, A Frame, or even scaffolding. It's rated at 300 pounds which meets and exceed national standards when it comes to safety. The craftsmanship on this product is exquisite. Made of aerospace grade aluminum, it is easy to tote around but really sturdy. The Little Giant also has pins to hold the various angles you might try to reach. Non-slip rubber feet provide a secure and reliable grip. This ladder also comes with full color pamphlet showing you how to use and get the most out of the Little Giant. It is an overall top choice for best in class. Rubbermaid makes all sorts of items for your home and this step ladder is one of them. This ladder is great for general tasks around the house but given that it only goes for up to three steps it might not be good enough for all of your home improvement projects. The RM-3W has a hand grip that makes it easy for you to move and transport the ladder and the feet also have rubber stoppers that make sure that the ladder will not slip and fall while you are on top of it. This ladder folds up easily so that you can store it without a problem and you can stash it away when not in use. 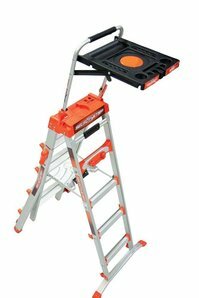 This ladder has a 200 pound load capacity despite being light enough to carry around at approximately 13 pounds. This is a great ladder that you can use for quick tasks around the house like reaching for things on high shelves or cleaning the top of high surfaces. This product has an average rating of 4.5 stars on Amazon because it is stable, secure, very easy to use and the different steps have a lot of room. This multi-purpose aluminum ladder is an option for people who are looking for a great all-around ladder that can be positioned around the house. This ladder folds in different ways to accommodate different kinds of projects. I use this along with my set of tools to easily access areas near my roof. It is made of aluminum alloy and can accommodate up to 330 pounds of weight on it. The whole ladder can be extended up to 12.5 feet. What’s great about this ladder is that because of the variety of ways that it can be folded and set up, you can use it for different tasks whether it’s just general cleaning around the house or for home improvement projects like painting or repairing. It has several joints that you can lock when folding the ladder to ensure that it will be safe to use. This aluminum ladder is a great item that you will love having in your house and when not it use, it folds down easily so that you can store it into a closet or in your garage. The Werner MT22 is a telescoping multi-ladder that comes in lengths of either 13 feet, 17 feet, or 22 feet. This ladder can be adjusted to 28 different working heights or positions by turning into either a 2-person stepladder, and extension ladder, or a scaffold. Don’t worry about the MT-22 being hard to adjust when converting it to suit different positions because it has push knobs that are soft-touch. What makes it even more special is that it is a professional quality ladder that has steps that are riveted to help keep a good foot-hold and traction on the feet to prevent the ladder from slipping meaning that this ladder is very safe. It is often compared in reviews to the Little Giant, but it is going to be a little heavier in general. Despite this, the ladder by Werner has over 1,000 reviews on Amazon and is a best-seller. These ladders would be great in any home and provide you with just the right functions to be able to complete your different projects. Want to see more articles about home improvement? See our review of impact drivers vs wrenches here.